Some time ago our testing laboratory got a new ADSL2+ switch, that's why we decided to take our chance and test a couple of ADSL2+ modems from different vendors. 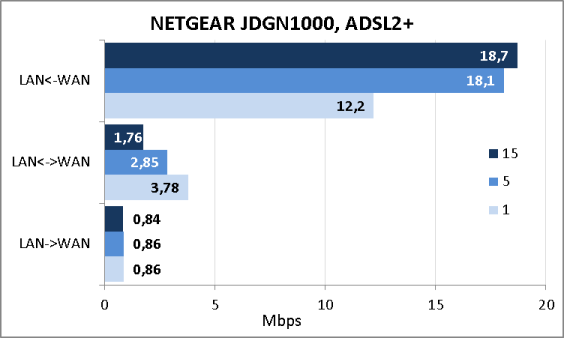 Today we are glad to present our readers a review of a coherent wireless ADSL2+ router NETGEAR JDGN1000. Let's try to figure out its coherency properties. 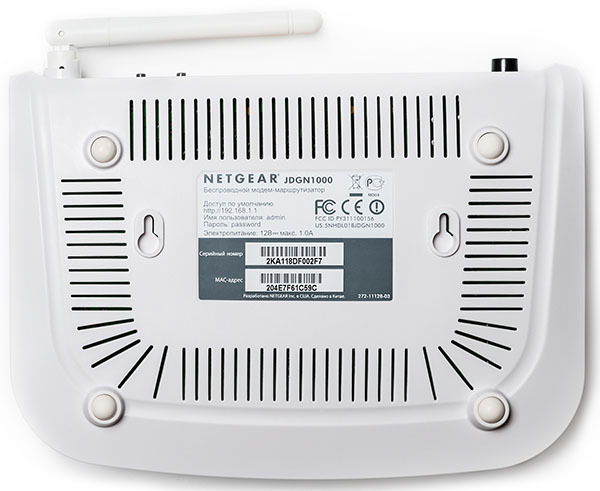 NETGEAR JDGN1000 ADSL2+ wireless router is produced in a light-grey plastic case which dimensions are 178x125x44 mm (excluding the antenna). For its work the device requires an external power supply with the following characteristics: 12V and 1A. The front and the side panels are quite plain, but there's a vent on the both sides of the case. On the top of the router there is the vendor's name and the LEDs indicating status of the device and its ports. 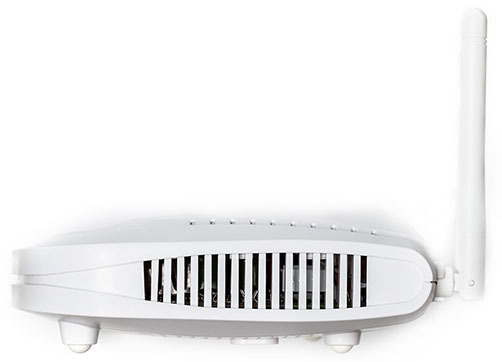 The “modem” bottom has a sticker with some brief information about the model, a vent, four rubber stands to place the device on the table, and two technological holes for placing it on the wall. On the rear panel there are four Fast Ethernet ports, one ADSL port, a power plug along with the on/off button, a sunken Reset button to reset the user's settings, WPS and WLAN buttons to simplify the wireless connection and to switch on/off the Wi-Fi network correspondingly. Moreover there is a nondetachable buggy-whip antenna placed here as well. Now let's have a look inside the case. 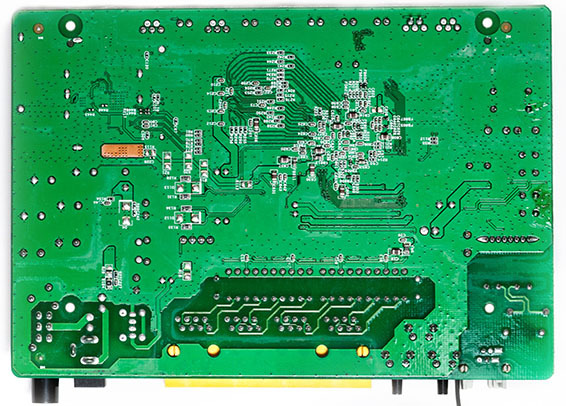 The hardware is represented by the only board made of green textolite. All the main elements are situated on one side. Alas, we didn't have enough courage to tear the radiator off the main chip, because the glue turned out to be outstanding! The RAM functions are fulfilled by the Hynix DDR2 chip H5PS5162, which capacity is 64 Mbyte. 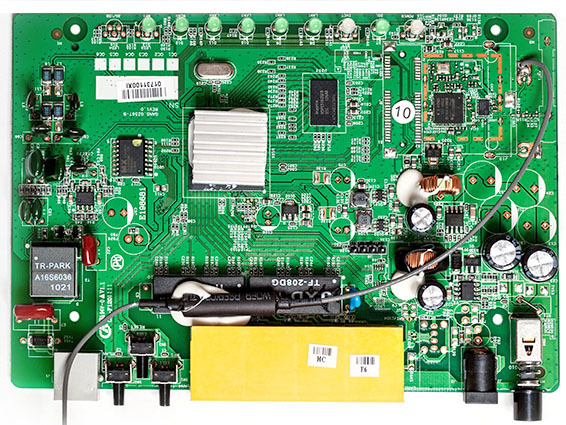 The Broadcom module BCM4313 is responsible for network support. Now let's turn to the software of the device. 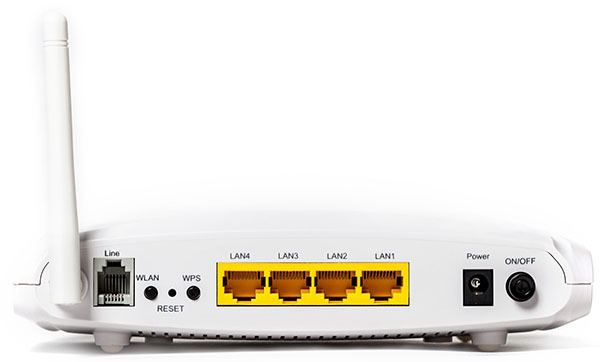 The procedure of changing firmware is accomplished with the help of the item “Broadband router update” in the group “Support” of the device web-interface, where you need to choose the file with the new firmware version and click the button "Upload", all the rest the router will do itself. The whole procedure takes approximately two minutes (excluding the time needed for downloading the firmware from the vendor's site). One can check whether the update is successful or not by using the item "Router status" in the group "Support" of the device web-interface. Changing the firmware version is also possible by the command line interface. tftp server OR file name not found. Now let's look at the web-interface features. To get the access to the web-interface of this device it is necessary to use any modern browser and address 192.168.1.1. By default the login and password are admin/password. Upon successful authentication one finds him/herself on the router home page. Web-interface is available in two languages: Russian and English. 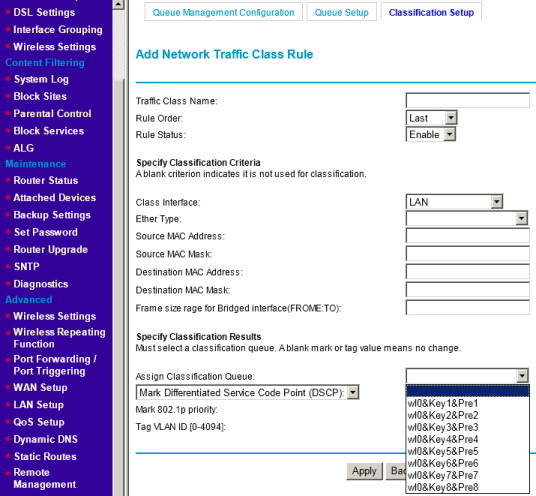 The contents of the NETGEAR wireless devices are pretty common: the menu is on the left, the settings page is in the center, on the right you will find a brief note about all the current configurations. 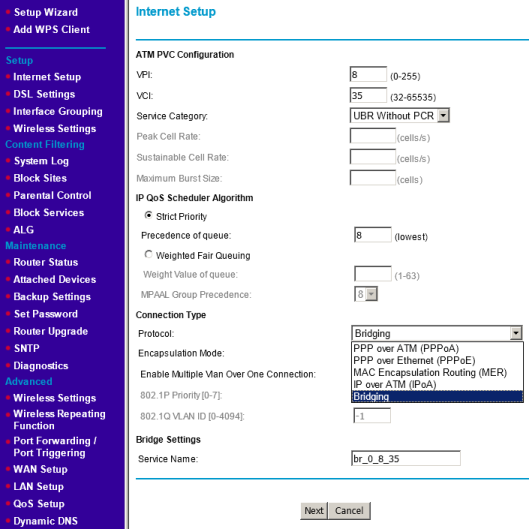 Using the first two menu items "Setup wizard" and "Add WPS client" the user can run the wizards which simplify the initial device configuration. 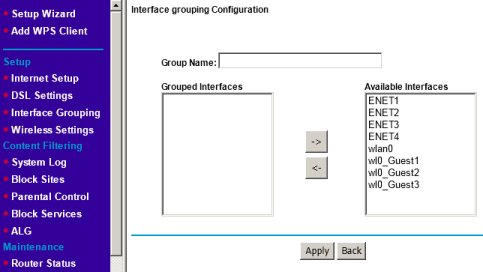 The group "Settings" contains four items to manage the JDGN1000 network interfaces. 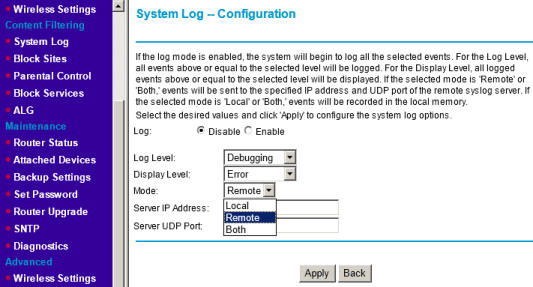 With the help of the item "Internet Setup" the administrator can choose the provider connection type and change the parameters of its work. 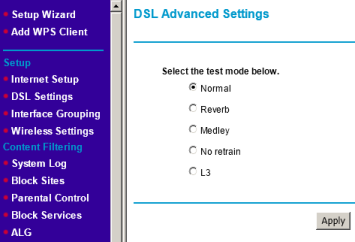 The physical line configuration is performed with the help of the item "DSL Settings". 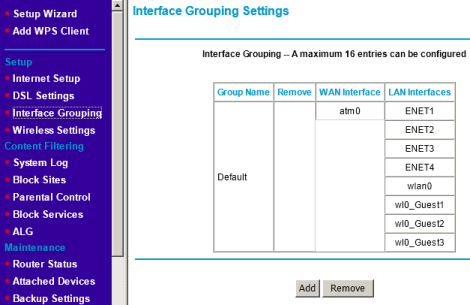 Ports of the router can be grouped via the item "Interface Grouping Settings". 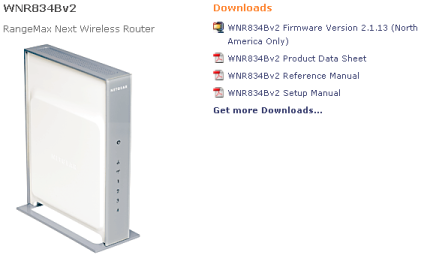 To change the wireless router's working parameters one needs to address the item "Wireless settings". 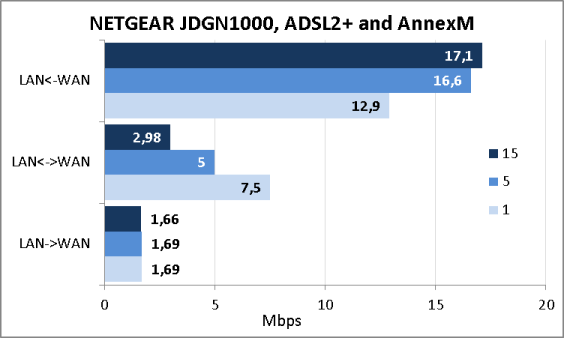 JDGN1000 supports up to four wireless networks simultaneously. The items of the group "Content Filtering" give the administrator a possibility to look through the log, block certain sites or services, manage parental control and set the working parameters of the application gateway. 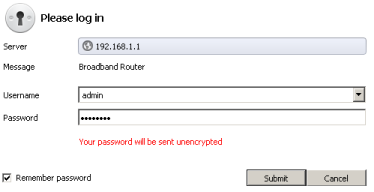 Some information about the device and its main options is shown in the item "Router Status" of the group "Maintenance". 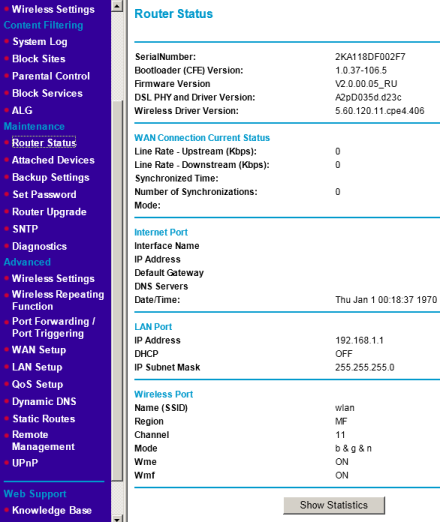 The item "Attached devices" contains the router client hosts info. To set the time synchronization with the servers on the internet it's necessary to address the item "SNTP" of the same group. Unfortunately, the time zone for Moscow was still GMT+3. 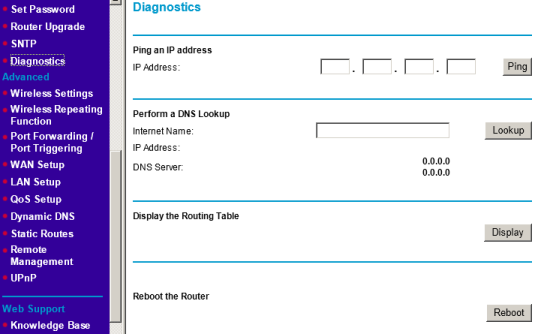 To have a look at the routing table, to run the ICMP or DNS queries is possible with the item "Diagnostics". Besides, you can reboot the device here. 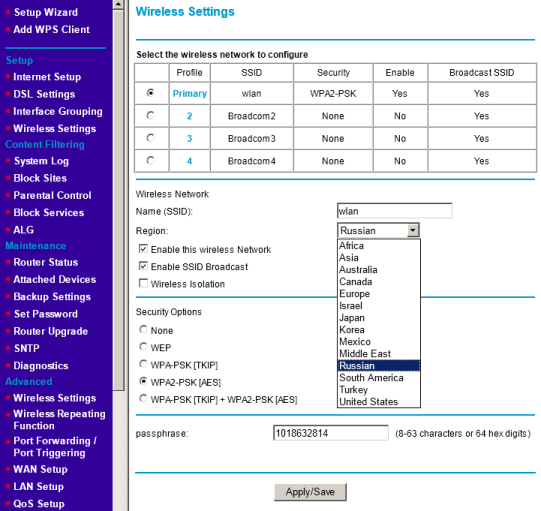 Some specific settings of the wireless network are available in the items "Wireless settings" and "Wireless repeating function" of the group "Advanced". With the help of the item "Port forwarding/Port triggering" in the same group the administrator can control the work of the virtual servers. The items "WAN setup" and "LAN setup" are used for placing the certain host into the demilitarized zone, switching on the security from the DoS attacks and for managing the DHCP server. 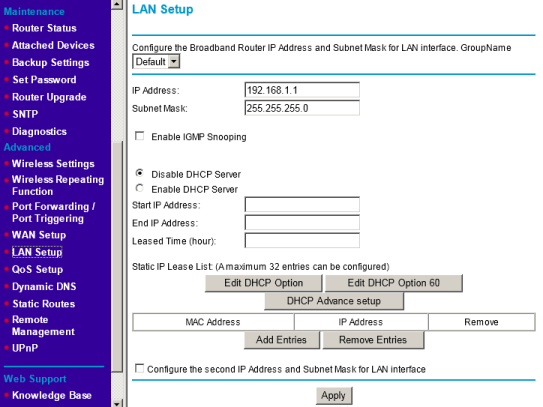 A very nice peculiarity of the device is the DHCP additional options support - the function which doesn't require a lot of extra resources but it can be essential in some specific situations. 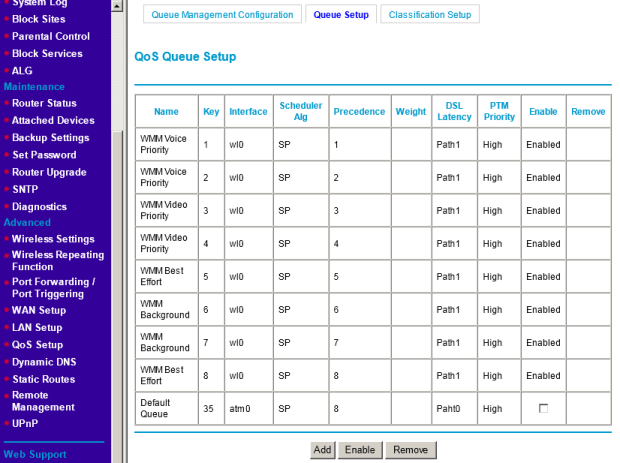 For a proper adjustment of the services quality there's an item "QoS configuration" of the same group. 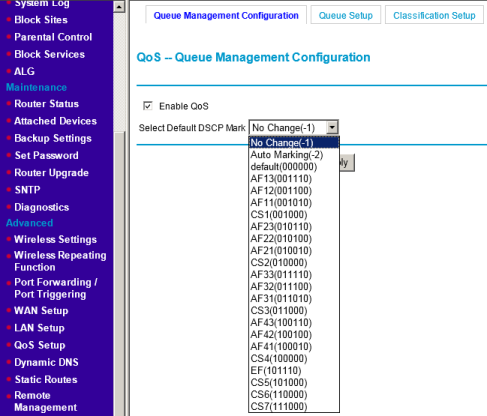 Here the administrator can choose the DSCP tag, manage the queues and the incoming traffic classification process. 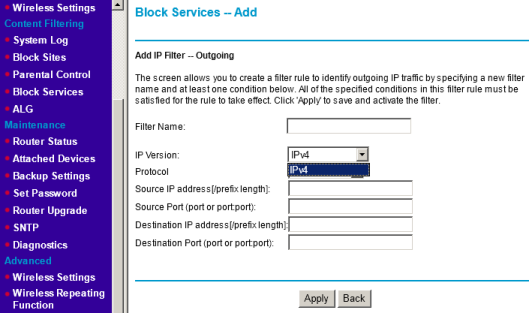 Via the item "Remote management" the user can specify by which protocols and ports the router itself is available for managing. 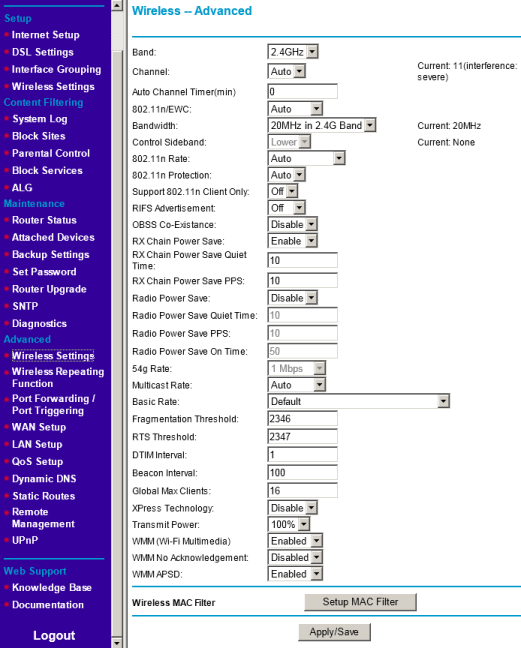 Moreover you can choose the interface through which the certain packets can be received. With the help of the two last items of the menu "Knowledge Base" and "Documentation" one can get the access to the additional material on the vendor's site. But it must be mentioned that the links lead to the pages describing a different device - WNR834Bv2. This brings us to the end of the device web-interface review. Now let’s turn to learning the functions of the device command line. To access the command line of the device the same login and password as for the JDGN1000 web-interface access are needed. We're not going to describe the options of each command, but will just give our readers an insight of the most interesting ones in our opinion. 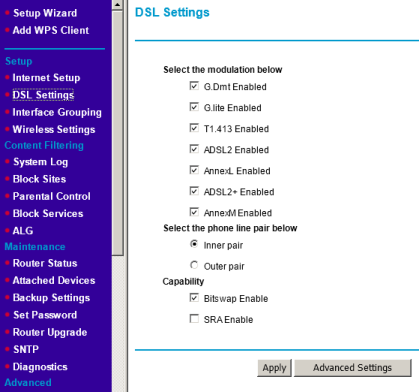 To see and change the parameters of the device operation with ADSL technology is possible via adsl. The ifconfig command provides the data about the status and parameters of the device network inerfaces. 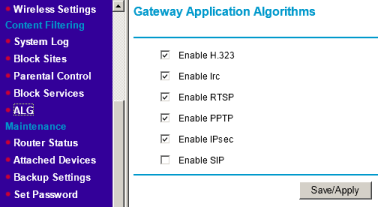 The default gateway and DNS servers’ addresses are set via the defaultgateway and dns commands. The route command works with the routing table. defaultgateway config [<interface(s) sperated by ',' with NO SPACE. dns config auto [<interface(s) sperated by ',' with NO SPACE. 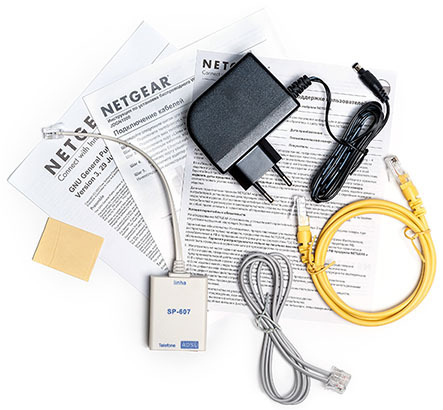 The information about the MAC-address and the serial number of the device can be got with the help of the macaddr and serialnum commands correspondingly. The password_configuration command allows you to change the administrator's password. The ps command output displays the list of running processes. The information about the system one can get via the output of sysinfo command, and about the RAM - via meminfo. To display the current firmware version one needs to run the swversion and softversion commands. The allledon and allledoff commands switch on or off the LED on the top panel of the device. Now let's get to the device testing. The first test which we always start this section with is to estimate the device booting time under which we mean the time interval between switching the power on and receiving the first echo reply via ICMP. 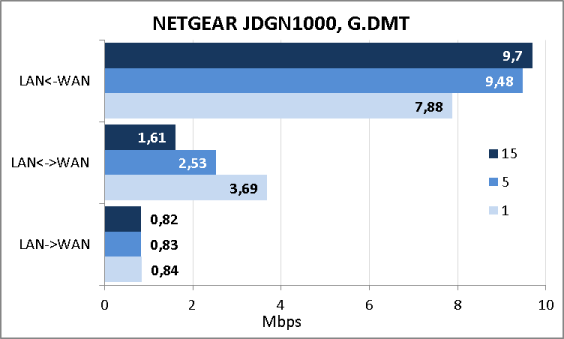 NETGEAR JDGN1000 boots in 31 seconds which is a common result for such a device. The second traditional test is to check the device security with the help of thePositive Technologies XSpider 7.7 (Demo build 3100) network security scanner. All in all there were detected three open ports: TCP-23 (Telnet), UDP-69 (TFTP) and TCP-80 (HTTP). The most interesting data are shown below. We decided to measure the network access speed not only for the highest speed modes, that's why further you can see three diagrams for the following connections: G.DMT, ADSL2+ and ADSL2+ with Annex M switched on, which lets increasing the speed from the user to the net. 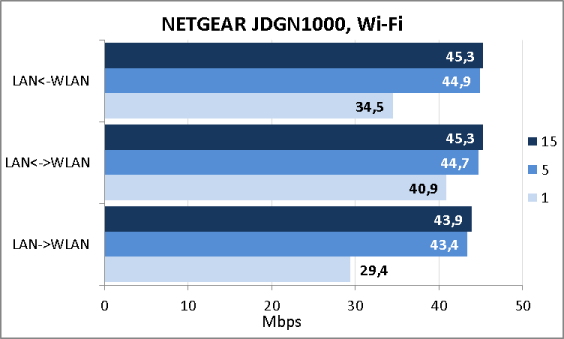 Since NETGEAR JDGN1000 is a wireless router, we couldn't skip the performance of its wireless module. This is the end of the testing section, now let's make conclusions. 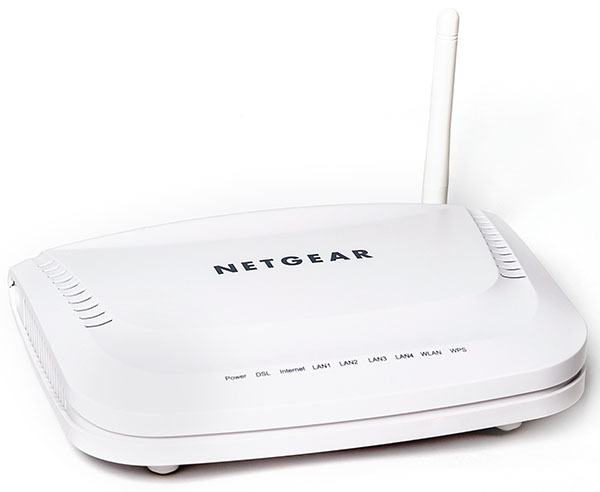 In the introduction to the review we called this wireless router coherent: in our opinion, the tested model reaches comparable speeds in each of its interfaces (ADSL2+, Fast Ethernet, Wi-Fi) which doesn't let it slant in advantage of any connection. 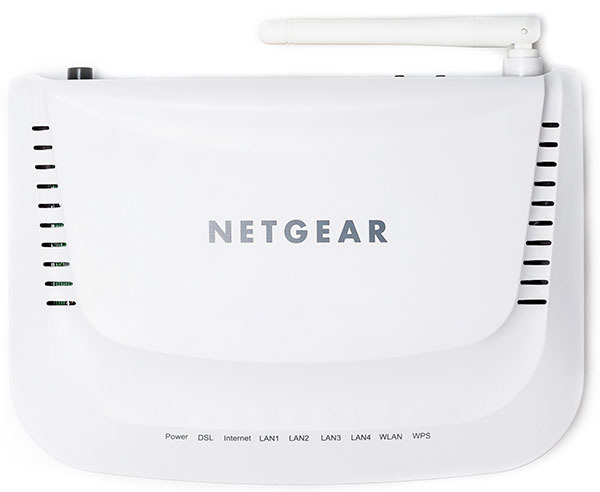 NETGEAR JDGN1000 can be useful for those, who don't want to build a high-speed local network, but fully use the whole available bandwidth of the WAN-interface. Four simultaneous wireless networks support. Several pairs of VPI/VCI for the Internet and IPTV support. Wrong time zones for Russia. 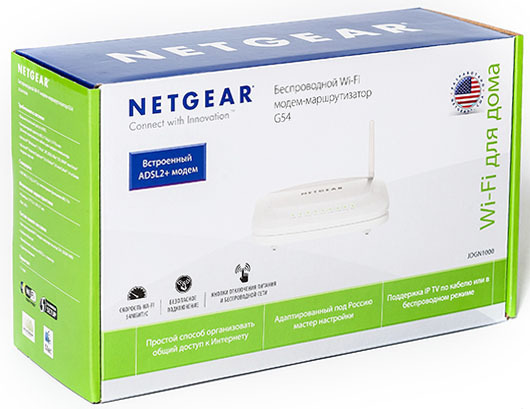 At the moment of writing this article the average price of NETGEAR JDGN1000 in Moscow online shops was 1300 rubles.